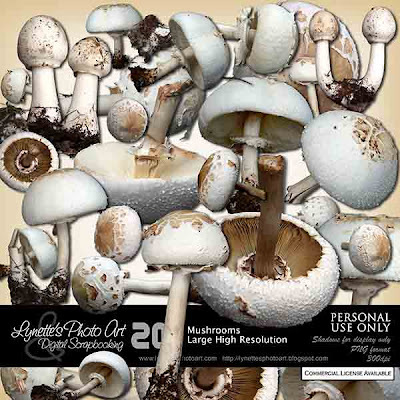 Mushrooms has 20 large, high resolution mushrooms in gorgeous detail and wide variety for all your natural and fantasy LOs. $3.99 at my PayPal store. Click image to enlarge. Click Buy It Now button below the image to purchase. Today I'm giving you one of these beauties to try out. Enjoy! Thank you! Your blog post will be advertised on the DigiFree Digital Scrapbooking Freebie search engine today (look for timestamp: 16 Sep [LA 07:00pm, NY 09:00pm] - 17 Sep [UK 02:00am, OZ 12:00pm] ). These are great, thank you!